Board exams are the milestones for every student and also plays the vital role as the entire career of an individual depends on them. 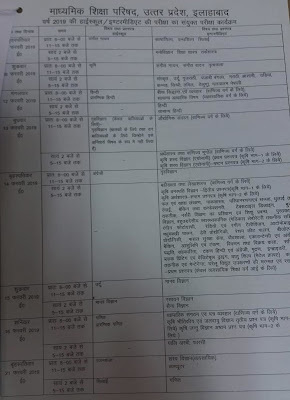 Recently, Central Board Of Education Uttar Pradesh has disclosed the 12th timetable 2019. The board examination for intermediate is going to begin from 7th February 2019 and will over within 16 working days. 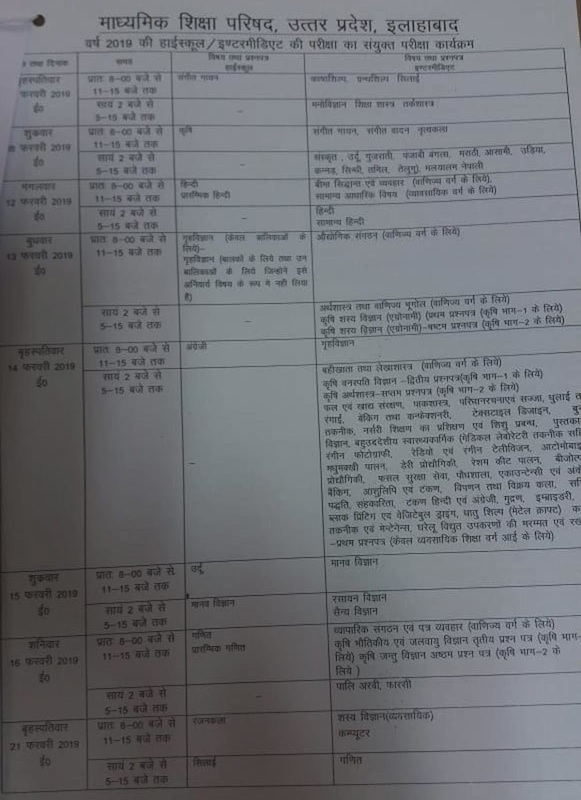 The Uttar Pradesh board of secondary and Intermediate is the biggest board and also accountable for conducting exams both in Hindi and English. A large number of schools in UP state are affiliated with the board and every year a huge number of students come across the board exams. If you are also appearing in 12th exams 2019 then here you will get the exact timetable for the same. The datesheet for intermediate examination 2019 is available on the official website of UP Board and students can download it from there. Board also create a PDF file for the ease of students and if there will be any changes they can confirm with it. Moreover, for each and every update regarding exams students can visit our page on regular basis. Here is the Date sheet for UP Board 2019 so take a look below to be aware of the same. Study hard and also take care of your health for better performance. Solve previous exams question papers according to exam hours it will assist you in how to distribute time. Before answering please read the question paper carefully. Be stressfree during exam period and take proper rest also for improving your productivity. Make sure you contain all the required material for examination such as Admit card, Pen, Pencil, and ruler etc. Also, take proper guidance of your guardians and teachers. Well..above description will help you to find out the exact dates for intermediate examination 2019 and still, any query regarding exams then comments below and if you wanna share something then feel free to share. Best of luck for good result and stay connected for the latest updates.